Hello there, having lived in London all my life (so far! 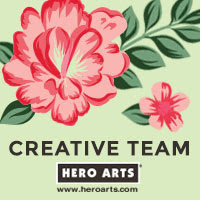 ), this stamp from Hero Arts spoke to me. There is not just London though, there are a huge variety of different locations available. They are wooden stamps, so stamp beautifully. For my card, I started off by stamping the Destination London stamp on to a piece of watercolour paper with Versafine ink. I then added black embossing powder and heat set. I took three shades of Distress Ink and blended these over. I took my Distress Sprayer and spritzed water over it. This was heat set and then I added Tumbled Glass over the top so that the water drops are now blue. The panel was then cut using a die from the Nesting Tag Infinity Dies collection. I took the Nesting Hearts Infinity dies, layered these up and embossed them in to a piece of Snow Layering Paper. The paper was adhered to a black A2 card base with ATG. The tag was then added with foam tape. To finish off, I took a piece of hemp cord and coloured it black using a Copic Marker. Once dry, I tied this in to a bow and added it to the tag with Multi Medium Matte. Here are the links to what I have used on the card. Please click on the picture or wording to be taken to where I purchased it. Affiliate links are used on some products. This means that if you make a purchase after clicking on my link, I receive a small commission with no extra cost to you. I truly appreciate your support when using these links. Please click on the letters below the product to shop at your favourite store - Simon Says Stamp (SSS) or Hero Arts (HA). I have embossed dies a lot in the past but I had never done it with nesting dies. I saw Jennifer McGuire do it a little while ago and loved the look. Of course, I had to have a go myself! Thank you so much for visiting me today. I hope you have a great day! Beautiful card!! Love tge stamped images and the hues of blue used. Embossing with nested dies looks great, will give it a go. Love the shading on your tag Michelle, such a pretty card! 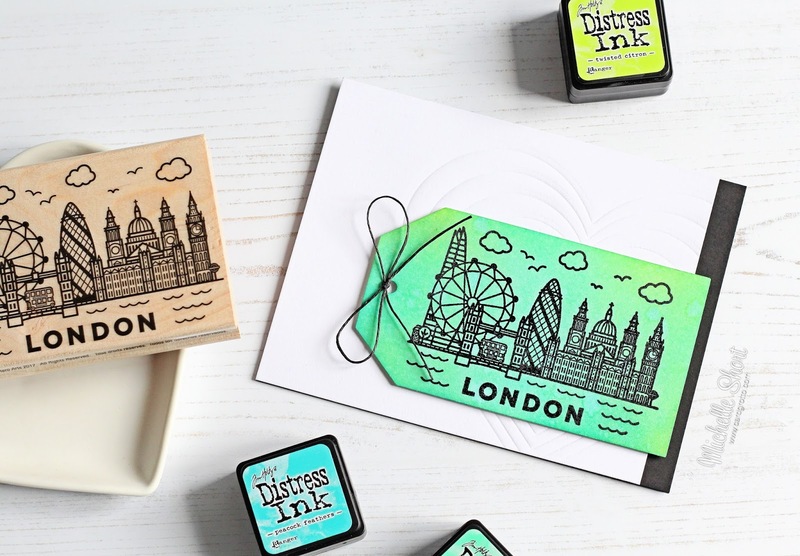 Nothing like good quality rubber stamps! 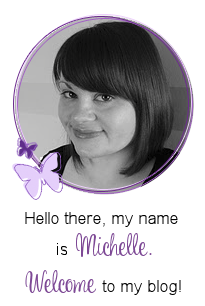 MIchelle, you have such a wonderful eye for choosing beautiful color combinations - I love the look of these particular distress inks together - it gives your tag a beautiful almost ethereal kind of quality. 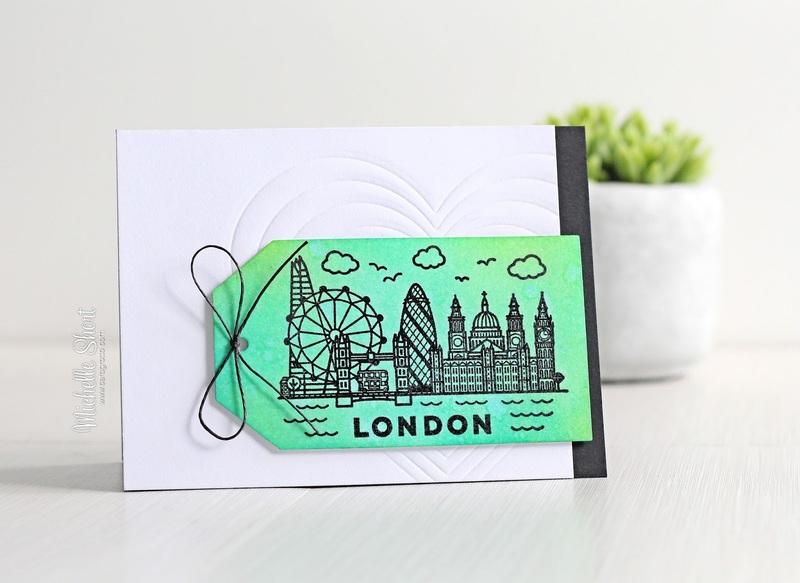 Such an eye catching card - perfect for your wonderful world class city! So pretty and a beautifully designed card. I love the colours of the tag, and the interest with the infinity dies behind. Gorgeous card! Gorgeous card...love your what you did! Off to pin this for another day.